Leverage stars Timothy Hutton as Nathan Ford, an insurance investigator who gains new appreciation for the everyman’s plight when his firm refuses to pay for experimental medical treatment for his son, resulting in his son’s death. In the first episode, airline CEO Victor Dubenich (Saul Rubinek) approaches a drunk and listless Ford, claiming a rival has stolen his designs. Having hired hacker Alec Hardison (Hodge), mercenary Eliot Spencer (Kane), and cat burglar Parker (Riesgraf), Dubenich wants Ford to coordinate their recovery of the designs. After the job, the team realizes Dubenich lied, that his rival rightfully owned the designs. With the help of grifter Sophie Devereaux (Bellman), they run a scam on Dubenich and after the rush and huge payoff, they decide to keep working together. In the midst of many brooding crime shows (including the recent gritty heist flops Thief and Smith), Leverage is a slick throwback to the fun of Mission: Impossible and The A-Team. It’s easy to think of Leverage as bad guys turned good, but any morality on the show is thankfully understated and nuanced. Though he tries to take the high road, Nate Ford can be a sloppy drunk. As cool as she can be during a con, Sophie Devereaux is also super-sensitive about her career as an actress. The other characters are likewise quirky enough to hold viewers’ interest, and their chemistry as a team improves as the season goes on. TNT aired the episodes out of the order in which they were shot. The episodes can stand alone for the most part, but on DVD they are in the intended order so you can spot more subtle character development. 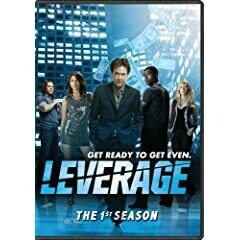 The 4-disc Season 1 set includes commentaries on all 13 episodes from the writers, producers, and directors, deleted scenes, a behind-the-scenes featurette, a fight choreography featurette with Christian Kane, a backstage spoof with Beth Riesgraf, and a candid look at the cast’s reaction to the show being renewed.